What's The Deal With The Millennium? What's the deal with "the Millennium"? Where is human history going? Many people believe that the Bible has not only accurately predicted human history to this point, but that it predicts a coming 'Golden Age'. This possibly impending event is called: "The Millennium". But there are very devout Bible readers who think this kind of reading of Scripture is actually a gross misreading of the Bible, and that what the Bible really says about the future may surprise - and even shock people today. The "Millennium" is the touchstone for how people label themselves when it comes to interpretting Bible prophecy. Depending on how they regard the Millennium, they will classify themselves either as, (i) Premillennial; (ii) Amillennial; or, (iii) Post-Millennial. Within these Millennial categories there are people who take a "fundamentalist" view, generally known as "Dispensationalists" and there are others who take a "Reformed" view, generally known as "Historicists", or the position I will argue for- "Preterist". The term "Millennium" doesn't actually occur in the Scriptures. But like many things that the Bible teaches, we shouldn't be hung up on terms because there are many Biblical truths which do not employ the terms we have identified them with. That is, there are things that the Bible teaches which it doesn't say with the terms we have given them. For example, the Bible does not say that God loves you, but it does teach it. The expression, The Millennium, means 1,000 years. It is based on a reference in Revelation 20. Rev. 20:3 and threw him into the pit, and shut it and sealed it over him, so that he might not deceive the nations any longer, until the thousand years were ended. After that he must be released for a little while. Rev. 20:4 ¶ Then I saw thrones, and seated on them were those to whom the authority to judge was committed. Also I saw the souls of those who had been beheaded for the testimony of Jesus and for the word of God, and who had not worshiped the beast or its image and had not received its mark on their foreheads or their hands. They came to life and reigned with Christ for a thousand years. Most commentators agree that this is a reference to "the Kingdom" which Christ repeatedly referred to. For those who think that this Kingdom will be an earthly, physical Kingdom, it is yet to come. This view is called Premillennialism. Most proponents of Premillennialism take the view that the Bible should be taken quite literally when it refers to Christ reigning "for a thousand years." Premillennialists are critical of any other views regarding the reference to the one thousand year reign of Christ. Added to this, they state, there are Old Testament prophecies which speak of God ruling on earth in a Kingdom for a long time. Isa. 11:10 ¶ In that day the root of Jesse, who shall stand as a signal for the peoples—of him shall the nations inquire, and his resting place shall be glorious. Do you want to be great? Who would you consider to be great today? It seems we live in a world which confuses greatness with fame. (Paris Hilton is famous, but, as far as I can tell, she is notGreat.) This confusion between greatness andfame has powerfully affected the way young people convert ambition into a life-long godly purpose. For a generation maxed-out on “self-esteem”, greatness is a claim that is quickly made by those who feel they are already great, usually with the synonym: “awesome” even though they have no particular reason to claim greatness. Greatness should be an attribute of those of noble character because what they achieve is largely for others. But what makes the Great, great? Certainly the Great are great achievers. They actually have something to be great about. They aren’t the “one day I’ll...” type of would-be-great, rather - they actually turn intentions into a plan of action, then carry out that plan. The Great overcome incredible obstacles and often have to have great courage and tenacity to do so. The Great persist in their mission despite massive criticism. The Great influence others, the Greater leave a legacy. In Luke 9:44-48 we read of Jesus declaring something profoundly great to His disciples. His disciples are inspired by Christ’s greatness and begin to discuss among themselves which of them would be the greatest of His followers. It would be fair to assume that Christ would sharply rebuke His disciples for their pride. But He doesn’t. Curiously, he offers them a way to redeem their desire for greatness. He took a child and placed him on His side and taught them about greatness. Wanting to be Great can be noble especially when carried out with humility and consideration for the vulnerable. Greatness leaves its mark on the next generation in an inspirational way. Greatness in service for Christ is not necessarily a church ministry, but is more probably about doing what seems ordinary (a child) in an extraordinary manner with extraordinary commitment. It might sound “humble” to answer our opening question, “No”, but this may actually be false humility masking fear or even perhaps laziness. We desperately need more young people to be committed to greatness! What are doing with your life that you could do for God, greatly? There was once a businessman who had an ability for making money. When he came to Christ he felt miserable about the way his business activities had led to people losing their jobs. He came to his pastor and announced that in order to make up for his previously ruthless business activities he was going to train for the Pastoral Ministry and become a church planter. “How will you live while you study and church plant?” asked his pastor. “It’ll be a struggle” he replied, “I’ll go from being a wealthy businessman to a poor pastor” he chuckled. Whatever you’ve committed your life to, consider this: how could you do what you do, greatly? Great people, truly great people, are those who have learned to redeem their pursuit of greatness by ordering their lives according to the Word of God. May God grant you the desire, means, and plan to do something great for Him which will leave a lasting legacy for generations to come, which is perhaps why Christ used a child to make these points. 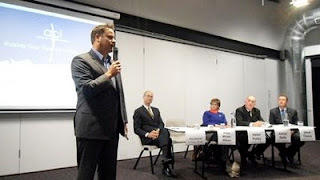 Candidates for the Federal Seat of Bass were given an opportunity to address the Christian community on Wednesday night at the Tailrace Centre in an event organised by the Australian Christian Lobby. Each of the Lower House Candidates fielded questions on their views that Christians in particular feel strongly about. 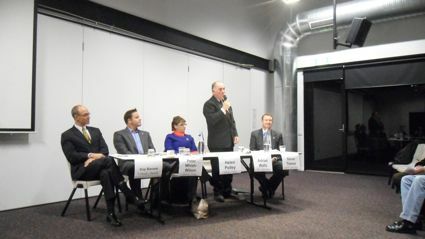 Three Senate Candidates, from each of the major political parties were also present both giving their perspective on a range of issues and responding to questions from the floor. 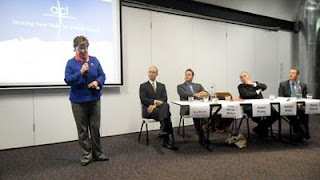 Senators Helen Polley and Guy Barnett shared how they both held common views regarding marriage, abortion, and euthanasia. 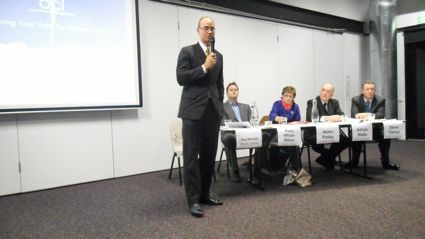 Greens Senate candidate, Mr Peter Whish-Wilson, shared his views on these issues stating, “I know I’m not going to win any votes for these positions, but I didn’t expect to in a gathering like this.” Steve Titmus spoke of his desire to be a long-term member for Bass who would use his background as a journalist to listen to what the electorate is saying. 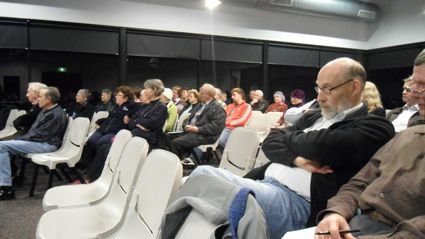 “I would be Bass’s representative in Canberra rather than Canberra’s representative in Bass”, he told the near capacity audience. Adrian Watts, the Citizens Electoral Council candidate, spoke in support of marriage, “Although I must confess, even though I am a father of 3 children and have been in a relationship with the same woman for 30 years, that I am not married”, he said. 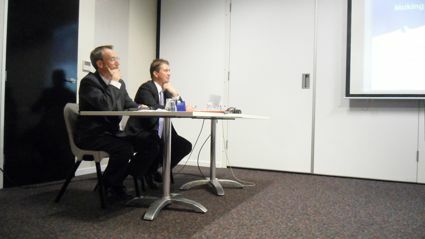 Candidates were each given an opportunity to make concluding comments. Senator Barnett, who has been placed third on the Liberal Senate Team ticket and therefore faces an extreme uphill battle to be re-elected, noted that Christian views were held by candidates on both sides of politics and he therefore encouraged his audience to vote below the line in the Senate Election to ensure that these particular candidates received support from the Christian community of Tasmania. Mr Peter Whish-Wilson, Greens Senate Candidate speaking to the crowd at the Australian Christian Lobby's Meet Your Candidate Forum, held at the Tailrace Centre, Wednesday August 11th. 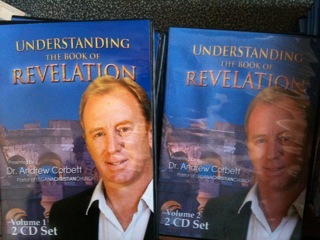 Jeremiah Part 7 from Dr Andrew Corbett on Vimeo. Get your copy of this ground breaking eBook! 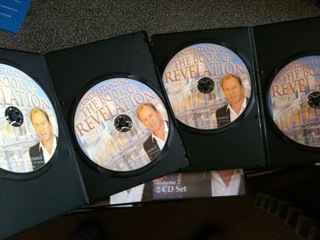 Regarded as one of the leading exponents of the Book of Revelation, Dr Andrew Corbett in this 4 Part series on the Book of Revelation (presented as a seminar) is now available as a 4 Audio CD set.Order this 4 Disc Audio CD for a donation (recommended price is $20 plus shipping) of any amount for a limited time. The Apostle Paul wrote to the Corinthians that they were now washed, clean, and made new. Sounds like a pretty good church doesn't it? But how many of us would feel comfortable around the type of people Paul was writing to? There were mended people. But to be mended you first had to broken. First Corinthians 6:11 ¶ And such were some of you. But you were washed, you were sanctified, you were justified in the name of the Lord Jesus Christ and by the Spirit of our God. First Corinthians 6:9-11 ...sexually immoral, nor idolaters, nor adulterers, nor men who practice homosexuality, nor thieves, nor the greedy, nor drunkards, nor revilers, nor swindlers will inherit the kingdom of God. And such were some of you. But you were washed, you were sanctified, you were justified in the name of the Lord Jesus Christ and by the Spirit of our God. How are we going to respond, as a church, as God increasingly answers our prayers? As we ponder this, consider this. We are praying for God to save and set free. We are praying for God to deliver, heal, and restore people. Chances are that God will answer our prayers. We can expect that people who need saving, setting-free, delivering, healing and restoring will be drawn to us -- but we should also expect that God will answer all of our prayers by actually saving, setting-free, delivering, healing and restoring lost, bound, oppressed, sick, and broken people. After all, unless we are able to show people that they are lost, bound, oppressed, sick, and broken through holding up the mirror of the Gospel, we will not be able to minister God's desperately needed grace to them. What's Up With Biblical Idioms? Wisdom is the kind of knowledge that leads to the best choice being made and the best decision actioned. The was once a couple who had five sons. The parents laboured hard to raise their boys. Before they were old enough to go to school, their mother would spend creative hours teaching and training each of her boys. But the family were rocked when this caring wife and mother tragically died leaving her husband to solo parent his boys. In order to support his family after his loss he was forced to work a second job. It wasn’t long before his four eldest boys felt neglected by their dad and in all-too-predictable fashion began to hang out with the wrong crowd. But not only was their dad hard-working, he was also sensitive to his sons. When he heard that his eldest boys were hanging out in the Mall with the gangs, he went down there and pleaded with them to come home. They laughed at him. But he persisted. The passing crowds stared at him as he cried and wept and screamed out to his unrepentant boys from across the Mall. Meanwhile, his boys were being enticed by these gang leaders to join in their schemes. Wealth, riches, ease, pleasure, they offered. All of this could be theirs -in an instant- if they only took it from it from ‘the weak and undeserving’. Suspecting that he had nearly lost his boys all together to a life of crime and heartless debauchery he made one last plea. But he was too late. That night his wayward boys ambushed a wealthy and, what they had hoped was, an unsuspecting businessman. But they had underestimated their first victim.